Hello everyone! Well, summer is here. Which means is mosquito season. Did you know that the mosquito is the deadliest animal on Earth? Every year one to two million people worldwide die from mosquito-borne illnesses. Most commercial mosquito repellents contain a chemical called DEET. DEET is very toxic and has been linked to scary side effects like memory loss, tremors and even impaired brain cell function. 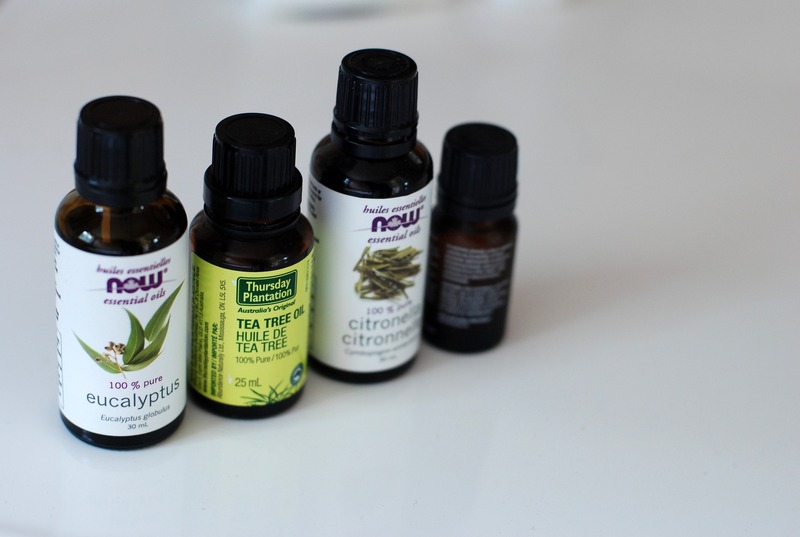 Fortunately, there are a bunch of natural mosquito repellents in the market that are just as effective as repellents with DEET when combined with a natural mosquito control strategy. This is probably the most important step in the battle against mosquitoes. Mosquitoes need water to lay their eggs in. Go around your house and eliminate any sources of standing water. Empty any buckets, pet bowls, bird baths, flip over any kid pool, check your garbage and recycle bins for water deposits, check the gutters, etc. Repeat this process as often as you want. Mosquitoes are attracted to carbon monoxide, movement and the bacteria that grows on our sweat. After they pick a target, female mosquitoes target wrists and ankles where blood vessels are closer to the skin’s surface. To avoid mosquito bites, avoid exercising outdoors at night, restrain from wearing perfumes, wear light colored/loose fitting clothing, long sleeves shirts, long pants and socks to protect from bites. In conclusion, after considering the dangers of using commercial bug sprays, a natural mosquito control plan is definitely the way to go. Prevention and using multiple forms of natural mosquito repellents is the best method for a mosquito-free yard. 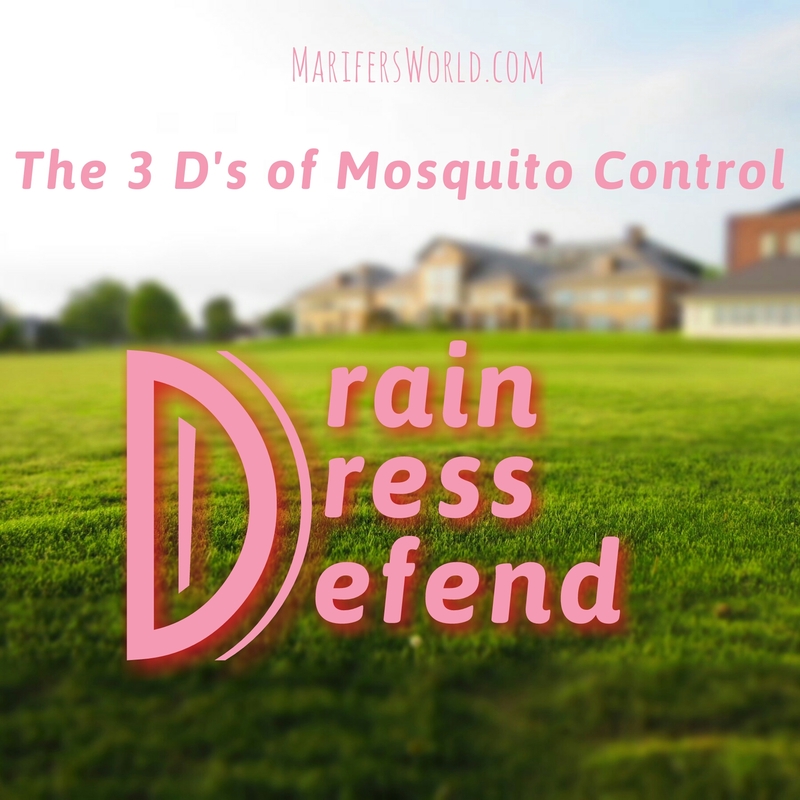 Remember the 3 D’s of protection from mosquitoes and your family will enjoy long summer days without the buzzkill. 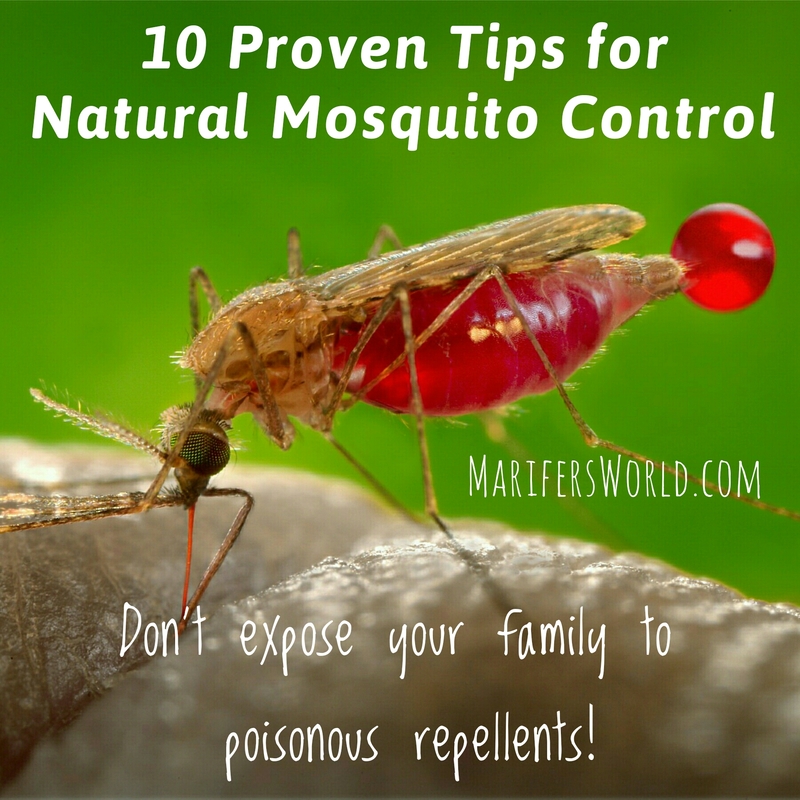 Do you have any other natural mosquito control tips to share? Let me know in the comments. This entry was posted in Gardening, My Home and tagged backyard, garden, outdoors, pesticides. Thank you, Marifer, for such valuable information. The BBQ trick is my favorite! I will be using that.